A lot of folks around here were pretty unhappy when the state arranged a big clear-cut last year on the northern end of Cardigan Mountain State Park, up by the Firescrew Trail and Cilley’s Cave. Our neighbor Dave Stacy was one of them. He sits on the town’s conservation committee, and he was especially concerned about the erosion that was likely to result from stripping all the softwoods off a large, steep slope. He and the committee wrote a letter to the state and asked what could be done. The clear-cutting went ahead as planned. But on Saturday morning, early, Jim and Virgil went up to the town house, where a dozen or so volunteers were gathering. (Ursula and I had an even earlier start, driving to Hanover to watch a rowing regatta on the Connecticut River.) Nearly 2,000 seedlings, provided by the state to re-seed about 40 of the acres that had been clearcut, were waiting there, bundled together with twine and stacked in paper sacks in the back of Dave Stacy’s truck. Jim and Virgil joined a caravan of four-wheel-drive pick-ups up New Colony Road and beyond a gate onto state land, over a deeply rutted gravel road to the log landing at the base of the clear-cut. Virgil didn’t register the other recently logged areas on the way up there, or notice that the logging contractor had ripped out a couple of massive, century-old granite culverts and put steel pipes in their place. But the adults did, and it added a gray feeling to the overcast morning. Jim and Virgil, working together, carried their paper bag stuffed with white spruce seedlings. (Other teams planted Norway spruce and black walnut, to guard against monoculture.) They picked their way uphill from the skidder road, scraping and digging little holes in the rocky soil and tamping in the small dark-green shoots. The six-inch seedlings disappeared among the scrappy sumac and alders and puckerbrush coming up fast in the clear-cut. Jim showed Virgil mounds of “moose loops” (the large animal’s droppings) on mossy granite and deep moose tracks in soft mud. From the height of the cut they worked over and back down in a line and then up again, by which time Virgil had enough of the black flies and prickers and the hard work. (Toward the end, to keep him going, Jim had sunk low enough to promise him a minute on the computer for each seedling he helped put in the ground.) They called it a day after ninety minutes, leaving the other volunteers to finish off the rest of the re-planting. Conservation can be an abstract concept, even for adults. Virgil learns about the environment at school; he’s watched TV programs about conservation. Saturday’s sweaty exercise in tree-planting was a rare chance for him to be involved. At the very least, he got a visceral, on-the-ground view of how rough and bony this land is here in central New Hampshire, and how hard it is to move around a cut-over patch of forest. He got a feel for how hard work can be turned into fun by teamwork, at least a little. 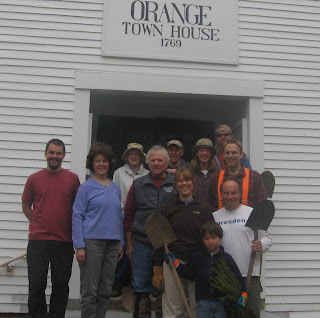 His morning among that group of volunteers, creating room for new trees to grow, brought the idea of conservation home. It was clear to Jim as they worked that Virgil was fascinated by how long it would take the seedlings to take root and grow tall. At one point, he leaned on his shovel and looked at the distant forested hillsides. He told Jim that he hoped the trees they were planting might someday look just like those. I hope Virgil will see that hillside grown up in forest. Even before then, I hope he feels proud for having helped nurture the land we share. • “New Hampshire parks could be up for sale,” June 2009 article in the Union Leader, linking to a list of the 27 parks that were considered “underperforming,” including Cardigan State Park. • “Protecting Parks: New Hampshire plans for the future” by Marc Chalufour updates the story in the print version of AMC Outdoors (May/June 2010).